Trips down the Genesee River average 2.5 hours on the water. Click here to check the current river conditions. Directions from Buffalo - Take Rte 90 West to Route 400. Follow Route 400 to the Route 20A Interchange then turn left onto Route 20A East. Follow Route 20A East to Warsaw. Turn right onto Route 19 and head South out of Warsaw. Turn left onto Route 19A and follow that through the village of Castile. Turn left just past the "Letchworth State Park" sign onto Denton Corners Road and follow that to the Castile entrance at the park. Once in the park head South and follow the "rafting" or "Lower Falls Restaurant" signs. Our office is across the street from the restaurant, inside the South Pool House. From Rochester: Take Route 390 South to the Mt. Morris exit. Turn left onto Route 408 and follow it into the village. Turn right onto Route 36 North. After crossing the river, watch for Letchworth State Park sign. The park entrance will be on the left side of the road. Follow the rafting signs to our office, we're across from the Lower Falls Restaurant. It is a 25-minute drive from the Mt. Morris gate to our office. Saturdays, Sundays, and holidays (call for departure times). Cost: $45.00 per person. Wetsuits are required in the early spring and late fall. 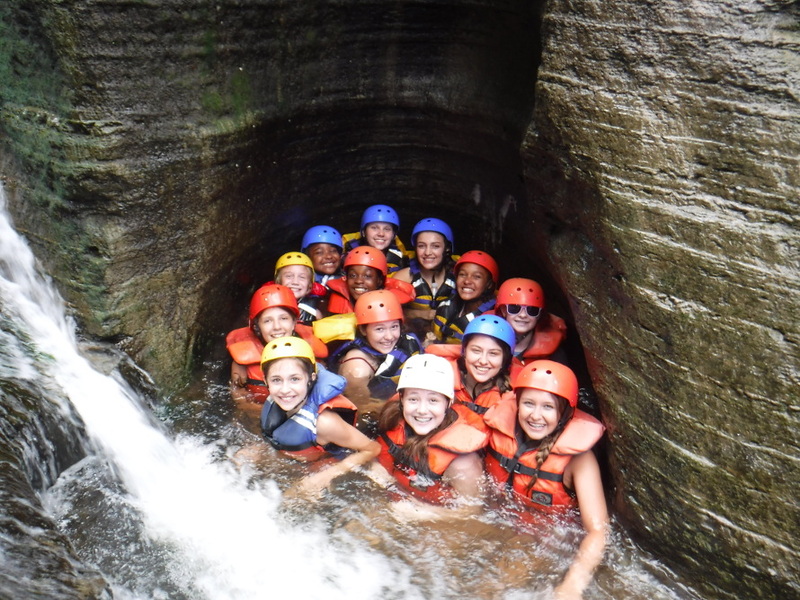 A trip down the river through “The Grand Canyon of the East” provides memories that will last a lifetime and is the perfect trip for first-time rafters, youth groups, and families with children. After meeting at the South Poolhouse and changing into river apparel, you'll meet your trip leader. You’ll be issued a paddle and PFD, be given a safety talk, and then walk about 10 minutes to the river's edge. Five and one-half miles of spectacular scenery and fun rapids await you and your fellow paddlers. On warm days, you can cool off body surfing at "New Wave Rapids" or get soaking wet at "The Leap of Faith." With a little luck, you may even see some of the animals that inhabit the park. The park is home to beavers, deer, eagles, hawks, raccoons, and river otters, just to name a few. Upon reaching St. Helena, our bus awaits (weather conditions permitting) to bring you back to the office to change back into dry, clean clothes and to enjoy a light snack. During the summer months, the river often becomes too low to raft. When this happens, we use inflatable sit-on-top kayaks in order to enjoy the gorge. 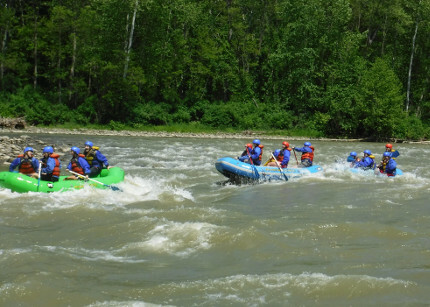 The ride is calmer and may take a little longer than when we're rafting, but hey, that just gives us more time to enjoy ourselves. (It may also require you to get out of your boat at times to walk a short distance through shallow water.) We are solely reliant on rain in the watershed at our Letchworth site. Water levels will determine what type of craft we will be using. Come explore the park from a perspective only we can give you. One of our naturalists will accompany the trip, offering narration during the frequent stops along the way as the beauty that is within the gorge unfolds before you. Lunch will be served in the canyon. A variety of topics are available, including park ecology and history, philosophical or religious perspectives, etc. A minimum party of eight required. Cost: $60.00 per person. Please visit our Special Events page to view some unique outings at the park as well as at other locations throughout the year. © 2019 Adventure Calls Outfitters, Inc.